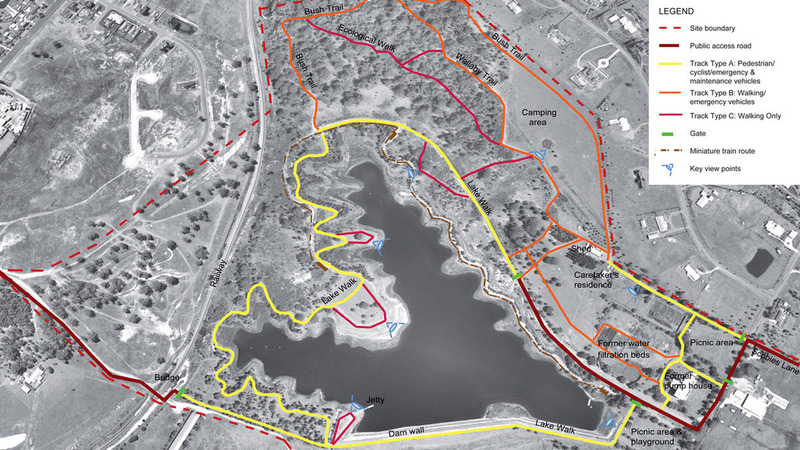 The Walka Water Works Master Plan prepared by Corkery Consulting provides a framework for the long term development of recreation facilities and management of natural and cultural heritage values throughout the Walka Precinct. A key component of the Master Plan is the development of an integrated network of tracks and roads to provide safe, enjoyable and efficient access for pedestrians, cyclists as well as emergency and service vehicles. Maitland City Council engaged Corkery Consulting to prepare a more detailed concept design for the track network to allow staged implementation as funds became available. We prepared a detailed analysis of the site to identify constraints and opportunities presented by the existing site conditions, including undulating landform, central lake, heritage buildings and water treatment infrastructure as well as extensive stands of trees. Optimise connectivity between the facilities and sites throughout the Precinct together with existing and future linkages between the Precinct and adjoining roads and paths. Provide access to existing and proposed recreation facilities and opportunities incorporated in the Master Plan. Maximise use of the various existing tracks while taking account of their alignment and condition. Address site specific physical conditions (soils, slope, and vegetation) of the areas through which the various tracks pass. Optimise the visual and physical experience of track users as they walk or cycle along various sections of track. Take account of the likely level of usage for the various sections of track and appropriate width requirements. and surface material. Implementation of the proposed track network involves a combination of upgrading sections of existing track combined with construction of new sections of track. The works required for each section of track were described in detail in relation to alignment, surface treatment, drainage, structures and signage. A set of typical details was prepared by Corkery Consulting to assist Council to implement the project over time as funds become available.